A service provider or vendor might want to publish multiple copies of a report that should connect to different database servers or databases. In a true multitenant service solution, we would have a singe database with row-level user mapping tables that filter data by the logged in user. True multitenant solutions require quite a lot of planning and development work to implement. In smaller-scale or interim solutions, copies of a report can be deployed to different workspaces and then queries can be parameterized to use different database connections. 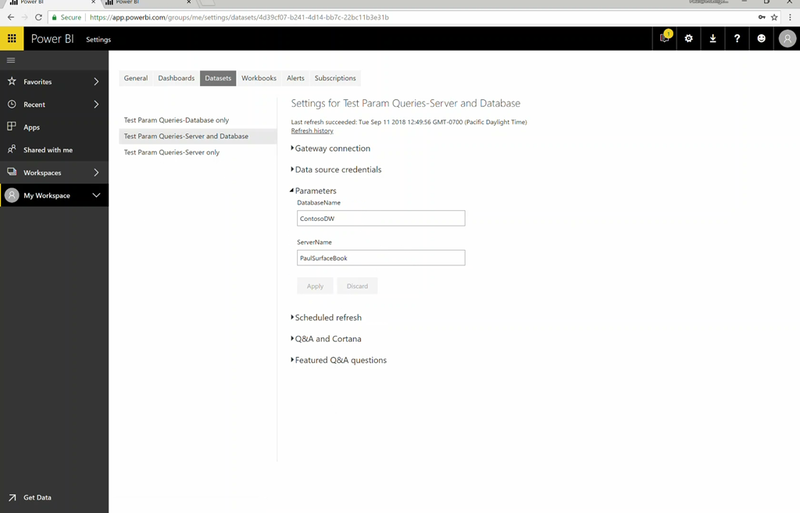 In this post, I’ll demonstrate deploying and configuring such a solution where the server name and database name have been parameterized and setup to use the on-premises gateway to connect and refresh data. I’ll also setup scheduled refresh. The full video walk-through is below but I’ll do a quick review to set the stage. Once deployed to a workspace in the service, the gateway must be configured with a data source for every possible server name and database combination. In my example, I can connect to my local server using the NetBIOS name, IP address or LocalHost. These all are acceptable methods but a data source must be added to the gateway configuration for each so the that the connection strings match exactly. Remember that the connection is from the on-prem gateway to the database server so names like LocalHost or an internal IP address will work just fine. In my example, I’m using the IP address of my local loopback adaptor on the local machine to connect to a local instance of SQL Server over the TCP connection. In the workspace, the dataset is bound to the gateway. Click the ellipsis and choose Settings. To bind the gateway to the dataset, click to select the radio button next to the gateway. This flips the switch titled “Use a data gateway”. Apply the setting and then you can refresh the data or schedule refresh. Finally, the parameters can be updated right here in the dataset settings. Posted in BI Projects, Business Analytics, Microsoft BI Platform, Power BI, Power Query, SQL Server. The message from the Microsoft Business Applications Summit this week was very clear: Power BI is growing up. 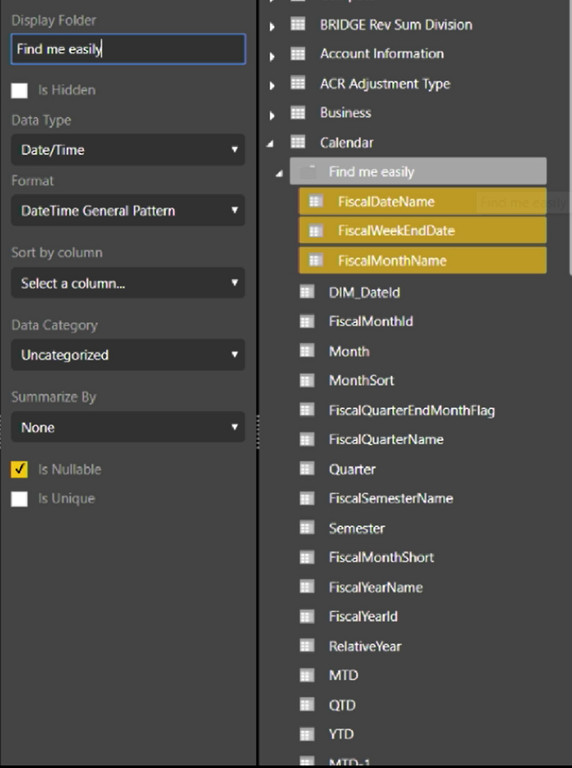 We have known for a while that Power BI is a great front-end tool for enterprise-scale tabular and multidimensional models. Power BI Premium will now allow almost limitless data scale using extremely large datasets by leveraging composite models that employ both DirectQuery and VertiPaq cached mode tables. This feature shatters the previous barriers where data models could only support either DirectQuery or cached mode (imported data). Additionally, Microsoft publicly unveiled plans to add IT developer centric features to Power BI Desktop for managing large models, version control and application development lifecycle. These announcements leave many open questions about how Microsoft will continue to support self-service and enterprise customers with one tool and about the long-term future of SSAS and Visual Studio-based SSDT. At this point, none of these tools are on the chopping block, but it is clear that James Phillips and his team have significant momentum and are not slowing down to wait for other products to catch-up. In this interview with Christian Wade, he describes the benefits of this new capability. Christian is Group Program Manager on the Power BI and Analysis Services product team with focus on data model development and scalability features. 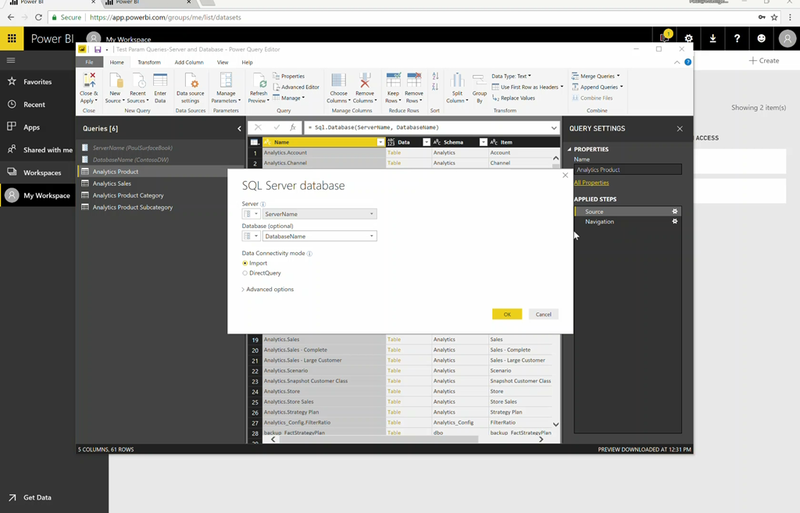 News Flash: Power BI Desktop will be the primary tool for serious, enterprise data model development. A bunch of features are in the works and will arrive soon for preview. The obvious question is what will happen to SSDT for Visual Studio and the answer is that it’s not going away but the product team is putting their energy into enhancing Power BI Desktop for now. It will likely have some kind of “Beginner/Advanced” switch to simplify things for the novice user and isolate advanced or complicated, developer-centric features. Like the BISM Normalizer tool created by Christian Wade, there will be a fully-supported compare and merge tool baked into Desktop. 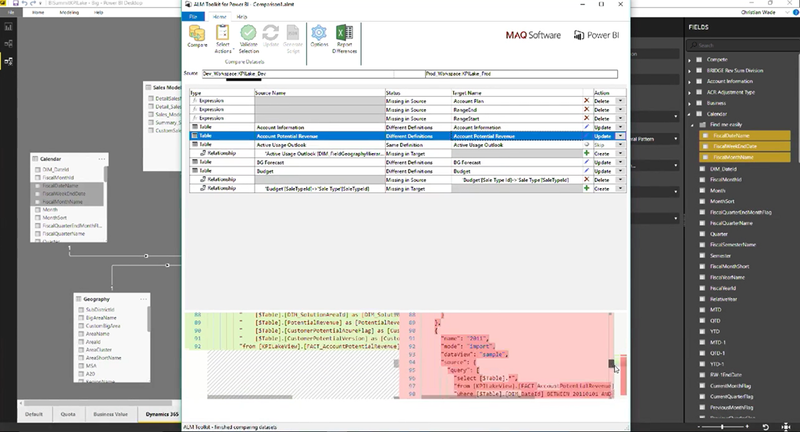 The early build is branded with components from MAQ Software. 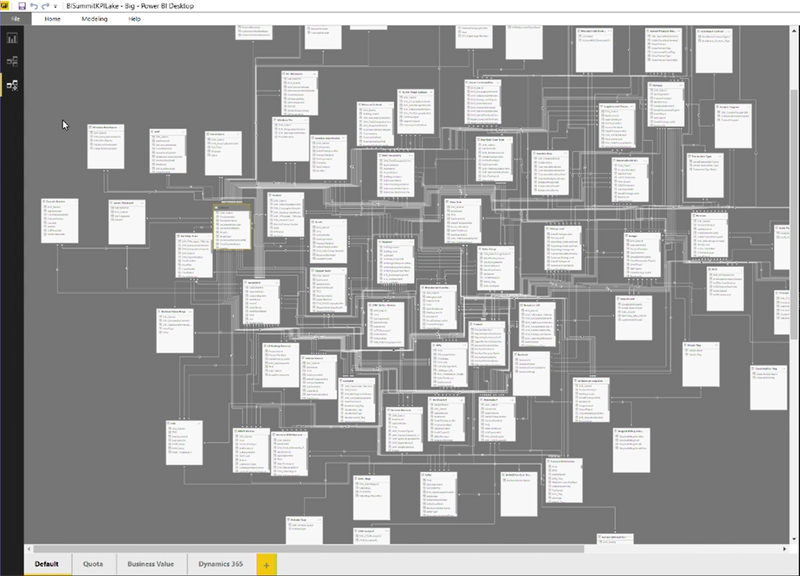 A new-and-improved diagram designer is imminent. It will allow large models to be more effectively managed and displayed. You will have the ability to save individual views of the diagram with selected, subject-area tables. Like in Visual Studio, properties can be set and managed in a Properties sheet window. Support for standard SSAS features like display folders is coming and can be managed here. With the velocity of features and updates, a comprehensive set of release notes are available here. This document will be updated frequently with the revised roadmap, feature history and announcements. 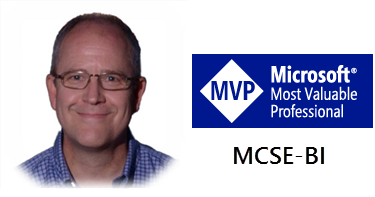 At the MVP Summit in March Kay Unkroth promised API endpoints and Powershell CmdLets for managing all aspects of Power BI. He even did a dance and sang a song to make the announcement memorable. This week, the product team delivered what they promised, with the announcement official here. The new, “modern workspace” eventually replacing current workspaces integrated with Office 365 groups. The new app workspace will no longer be bound to an Office 365 Group. The feature will be optional at first, but will replace current workspaces soon. Keynotes and Featured Sessions from the Microsoft Business Applications Summit are here. Posted in BI Projects, Power BI, SSAS Administration, SSAS Design, Tabular Models. This is a post about a post about a post. Thanks to those of you who are entering comments in the original May 12 post titled SQL, M or DAX? This is a popular topic. And thanks to Adam Saxton for mentioning this post in his Guy in A Cube Weekly Roundup. This is a HUUUUGE topic and I can tell that I’ve struck a chord with many BI practitioners by bringing it up. Please post your comments and share your ideas. I’m particularly interested in hearing your challenging questions and your thoughts about the pros-and-cons of some less-obvious choices about whether to implement transformations & calculations in SQL, M or DAX. This week, I have had engaging conversations on this topic while working on a Power BI consulting project for a large municipal court system. As a consultant, I’ve had three weeks of experience with their data and business environment. The internal staff have spent decades negotiating the intricacies and layers upon layers of business process so of course, I want to learn from their experience but I also want to cautiously pursue opportunities to think outside the box. That’s why they hired me. Tell me if this situation resonates with you… Working with a SQL Server database developer who is really good with T-SQL but fairly new to Power BI & tabular modeling, we’re building a data model and reports sourced from a line-of-business application’s SQL Server database. They’ve been writing reports using some pretty complicated SQL queries embedded in SSRS paginated reports. Every time a user wants a new report, a request is sent to the IT group. A developer picks up the request, writes some gnarly T-SQL query with pre-calculated columns and business rules. Complex reports might take days or weeks of development time. I needed to update a dimension table in the data model and needed a calculated column to differentiate case types. Turns out that it wasn’t a simple addition and his response was “I’ll just send you the SQL for that…you can just paste it”. The dilemma here is that all the complicated business rules had already been resolved using layers of T-SQL common table expressions (CTEs), nested subqueries and CASE statements. It was very well-written SQL and it would take considerable effort to re-engineer the logic into a dimensional tabular model to support general-use reporting. After beginning to nod-off while reading through the layers of SQL script, my initial reaction was to just paste the code and be done with it. After all, someone had already solved this problem, right? The trade-off by using the existing T-SQL code is that the calculations and business rules are applied at a fixed level of granularity and within a certain business context. The query would need to be rewritten to answer different business questions. If we take the “black box” approach and paste the working and tested SQL script into the Power Query table definition, chances are that we won’t be able to explain the query logic in a few months, after we’ve moved on and forgotten this business problem. If you are trying to create a general-purpose data model to answer yet-to-be-defined questions, then you need to use design patterns that allow developers and users to navigate the model at different levels of grain across different dimension tables, and in different filtering contexts. This isn’t always the right answer but in this case, I am recommending that we do as little data merging, joining and manipulation as possible in the underlying source queries. But, the table mapping between source and data model are not one-to-one. In some cases, two or three source tables are combined using SQL joins, into a flattened and simplified lookup table – containing only the necessary, friendly-named columns and keys, and no unnecessary clutter like CreatedDateTime, ModifiedDateTime and CreatedByUser columns. Use custom columns in M/Power Query to transform the row-level calculated values and DAX measures to perform calculations in aggregate and within filter/slicing/grouping context. I’d love to hear your thoughts and ideas on this topic. Posted in BI Industry, BI Projects, Business Analytics, DAX, Microsoft BI Platform, Power BI, Power Query, SQL Server, T-SQL. The results of last month’s Power BI Global Hackathon are in! The Hackathon was facilitated by our our PUG here in Portland with the goal of welcoming global contenders in subsequent contest. Five teams entered the contest using publically-available data to visualize and tell data stories using our favorite data analysis platform. Congratulations to Xinyu Zheng and Ron Barrett for winning the challenge with their entry, analyzing Yelp restaurant star ratings. 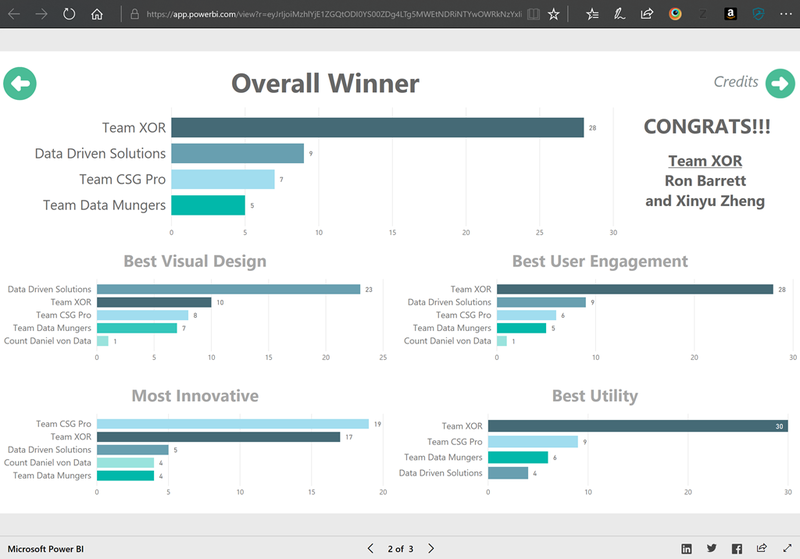 These were all great entries and you can view the contest results in the Power BI report below. I loved the creativity of this solution from Jeremy Black and Kirill Perian who analyzed alcohol sales statistics using infographics and bookmarks to switch out visuals on the same page. The presentation concludes on the last page of the report with an auto-advancing variation of “100 Bottles of Beer on The Wall”. Nice touch. I’m admittedly a bit biased because this was my design, with a lot of help from Brian, Ron and Greg. We used a series of tables to prompt a user for Power BI solution business requirements and recommend fitting solution architectures and components. We pushed some practical and technical limits in our project and I’ll write a separate post about it. This entry from Ron Ellis Gaut is a nice, clean orchestration of county health data, measuring health and comparing personal well-being and program efficacy. The entry from Daniel Claborne emphasizes machine learning predictions performed with R Script, commonly used in data science. He actually includes the annotated code and explains the technique and the approach using training and prediction data sets. The Portland Power BI User Group was one of the first and continues to be one of the most active in the international community. We meet on the 4th Wednesday evening every month in Beaverton, Oregon. Today there are many active PUGs all over the world. Posted in BI Industry, BI Projects, Power BI. This first week of the new year has been a lot of housecleaning for me (literally and figuratively… my office desk and cabinet will be clean by the end of the day!). Three years into teaching classes and workshops on being productive with Power BI, it continues to be a product requiring a lot of work to stay current. New features are introduced in every Power BI Desktop monthly update; not to mention updates to the cloud service and on-prem server. You would have to be a child of the 80s to get the Never Ending Story reference. Otherwise, it’s just a really bad flying dog – and pop song, which are both hard to explain, so we won’t. The point is that it’s an ongoing effort to keep skills, courseware and presentation material up-to-date. If you’re like me, sometimes all these updates can be a bit of a distraction (we’re talking about Power BI again – not the dog, movie or song… case in point). I’m excited by the continual innovations and improvements to Power BI. However, the foundational rules of good design don’t really change that much. Effective data curation, correct modeling and good core visualization design are as critical as ever. The trick is to know which new features may be used to improve foundational design and which ones you can leave as icing on the cake for minor enhancements. Updating courseware and workshop labs seems to be a never ending task and I’m hard at work revising older material and adding new content to prepare for new events this year. An important topic I will continue to revisit this year is how Power BI is used along with other Microsoft tools to create different types of solutions. I’m working on a new presentation to describe all of the incarnations of Power BI, used to deliver everything from self-service desktop reports – all the way up to enterprise-scale solutions for corporate users with governed and secured data – and most everything in-between. The first workshop of the new year will be a one day preconference before the Redmond SQL Saturday, on Microsoft campus Friday, February 9. You can sign-up for this event here. I’m working on a few others in the following months and will update this and other blog posts when they are scheduled. I hope to see you there. You are welcome to send me questions or suggestions about specific topics of focus. Just add a comment to this post, or reach me through Twitter or LinkedIn. Posted in BI Industry, BI Projects, Business Analytics, Microsoft BI Platform, Power BI, Self-service BI, SQL Saturday. Since starting the Guy In A Cube series over three years ago, Adam Saxton has become the front man for Microsoft Business Intelligence feature announcements and Power BI how-to tutorials. Joined by Patrick Leblanc last year, the Guy In a Cube series features over 200 short video tutorials with at least two new clips added every week. The Guy In A Cube YouTube channel currently has over 13,000 followers. I always look forward to spending time with both of these guys at community events. I first met Adam several years ago when he was a Senior Support Escalation Engineer for Microsoft who helped with a number of tough BI server setups. Patrick did senior level consulting work for customers in the field before joining Microsoft as Data Platform Solutions Architect. Adam and Patrick are natural born entertainers. With their deep knowledge and expertise with database technology, security and the entire BI, analytics and reporting stack; they offer one of the top online resources for learning and keeping up with the rapidly-expanding Microsoft BI platform. At conferences and events, I rarely see Adam without a camera in his hand and so was a real treat to get them in front of my camera for this interview. We chatted about how they got started and how they continue to use their series to highlight new and important features, and to provide guidance to support the Microsoft BI community. In this interview during the 2017 PASS Summit, we continue to explore the topic of this series of blog posts on Microsoft BI solutions for the enterprise. Patrick and Adam share their guidance about managing large-scale solutions, version control and multi-developer projects using Power BI, Analysis Services and SQL Server. Posted in BI Industry, BI Projects, Business Analytics, Microsoft BI Platform, MVP Community, PASS, Power BI, SQL Server, SQL Syndication, SQLServerPedia, SSAS Administration, SSAS Design, SSRS Administration, SSRS Design, Tabular Models.